With the popularity of Wifi IoT devices, there is an increasing demand for low-cost and easy-to-use WiFi modules. ESP8266 is a new player in this field: it’s tiny (25mm x 15mm), with simple pin connections (standard 2×4 pin headers), using serial TX/RX to send and receive Ethernet buffers, and similarly, using serial commands to query and change configurations of the WiFi module. This is quite convenient as it only requires two wires (TX/RX) to communicate between a micro-controller and WiFi, but more importantly, it offloads WiFi-related tasks to the module, allowing the microcontroller code to be very light-weighted. 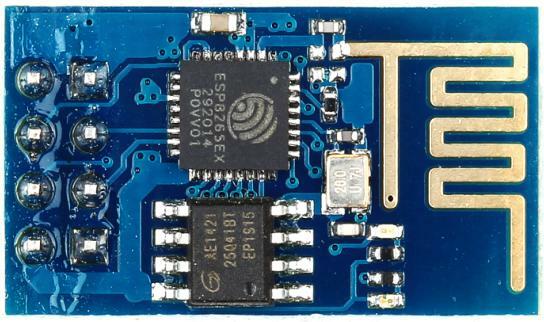 ESP8266 ESP-01 Serial WIFI Transceiver Module is a cheap and easy way to connect any small microcontroller platform, like Arduino, wirelessly to Internet. ESP8266 has powerful on-board processing and storage capabilities that allow it to be integrated with the sensors and other application specific devices through its GPIOs with minimal development up-front and minimal loading during runtime. Its high degree of on-chip integration allows for minimal external circuitry, and the entire solution, including front-end module, is designed to occupy minimal PCB area. ESP-01 WIFI Transceiver Module is addressable over SPI and UART, making this an exceptionally easy choice for anyone wanting to build an Internet of Things thing. You can use AT commands to connect to WiFi networks and open TCP connections without need to have TCP/IP stack running in your own microcontroller: You can simply connect any microcontroller to this module and start pushing data up to the Internet. ESP-01 PCB Antenna , after matching the distance to achieve open 400Meters. Connect the CH_PD pin to 3.3V to activate the chip. ESP 8266 works in 3.3V TTL so we need a level converter to communicate with our PC. You can use an FTDI converter for this purpose. Make sure that your FTDI is working in 3.3V. Connect your ESP module with the FTDI Driver and plug the FTDI to the USB port of your PC. CH_PD connected to 3.3v to enable chip firmware boot. For communication you must need another computer or a phone which has WiFi access. Connect the computer or phone with our ESP 8266 module through WiFi. You will have to configure the PC or mobile as server, use terminal software to set the PC as server. In realterm software you can change it in the port settings. Set the port as server and give a port number. Here 1234 is the port number. You can use the AT commands to set the parameters of your ESP module. All AT commands must end with a “\r\n” – a carriage return & a New Line. Use any terminal software for giving AT commands to the ESP module. 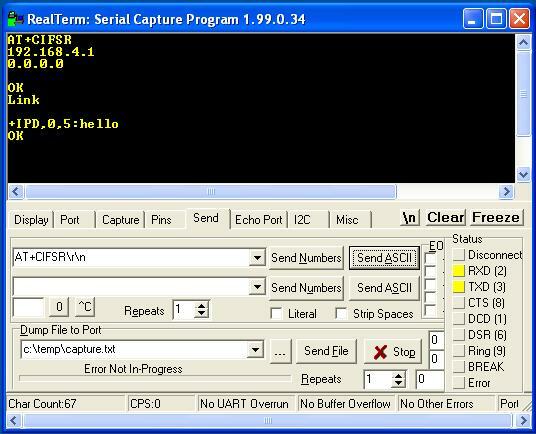 Initialize the ESP module by sending AT command, will get an ‘OK’ response. Query the ESP 8266 as client or as a server, here it is client. AT+CIPMUX? ESP8266 WIFI module has 3 modes of operation. AT+CWMODE? returns the Mode of operation of the module. CWMODE returns an integer designating the mode of operation either 1, 2, or 3. 1 = Station mode (client). 2 = AP mode (host). Let’s take a break from networking class to see if your little 8266 module is able to communicate with your network. Click on Start, Run, and type CMD and press enter. After sending the command AT+CIPSTART, connection get established thus get response as OK Linked. Now communication is possible, from the communicating PC we received a data in the format +IPD, size of the data : data with ‘OK’ response as shown below. From ESP module you can send data after. receiving >symbol. 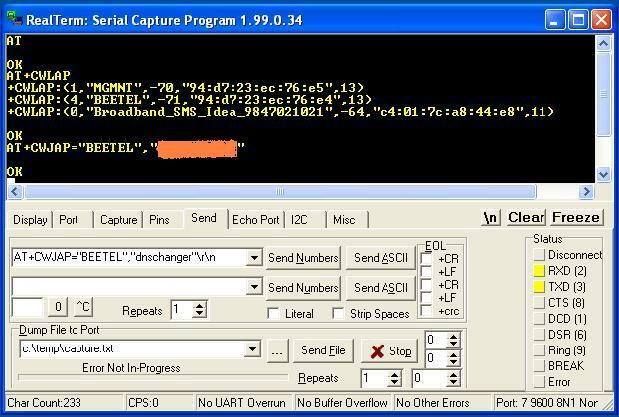 Send the exact data with data length which is mentioned in the AT+CIPSEND=<len> command. You will get a SEND OK after sending the data as shown below. 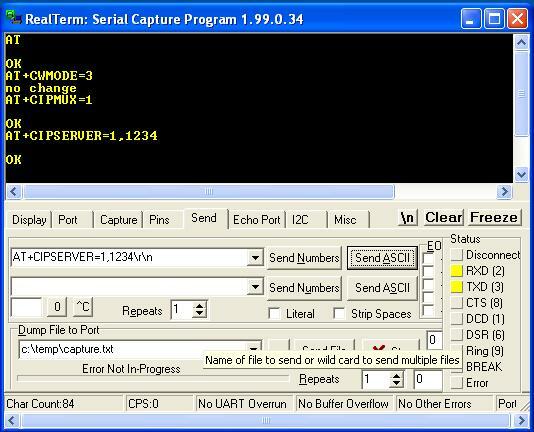 The user can configure the ESP 8266 as server by following commands. In order to configure the ESP as server you should enable multiple connections to ESP(CIPMUX=1). Then configure the ESP module as server by command AT+CIPSERVER=<par>,<port> ,we get ‘OK’ as response. And use this IP for communication from other PC. 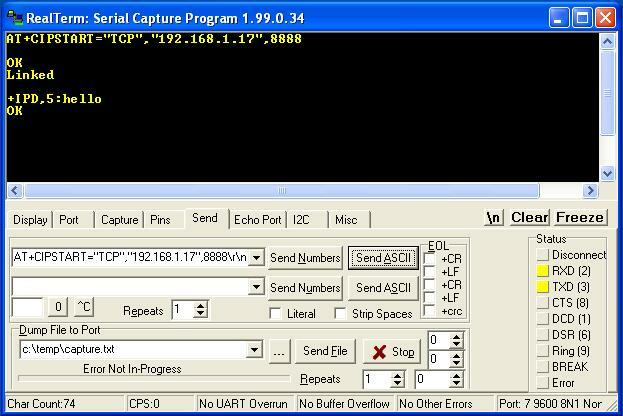 You will get the IP address by sending AT+CIFSR command. After connection get established with the IP, communication is possible from both sides. We may use AT+CIPSEND=<len> for sending a data. Note: If CWMODE is 3 (Both) you will get two IP address. Choose the station IP Address which is the first one. Now take another PC which has WiFI access connect it with our ESP 8266 module. Use terminal software to communicate with ESP 8266. 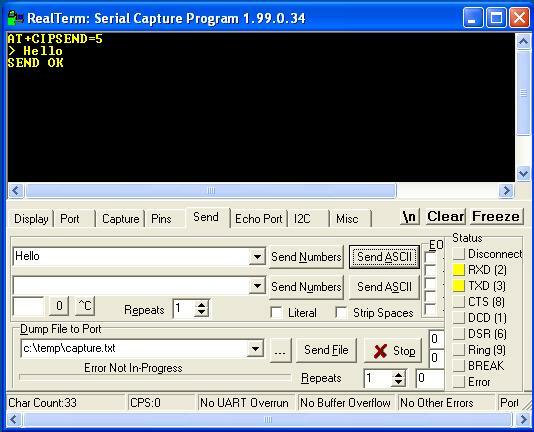 In realterm you can connect the ESP module by setting the port as module IP as shown below, where 1234 is the port number. This methods can be used to communicate only when two WiFi modules are in range. Now we will discuss about Internet of Things (IoT). So by using IoT the ESP module can be accessed from anywhere. In order access the ESP 8266 from anywhere, you should first connect it with an Access Point. The ESP 8266 can be connected to an Access Point by using following AT commands. The common commands for TCP client and server are explained below lets go through it ..
Initialize the ESP module by sending AT command, will get an ‘OK’ responce. Lists available APs with AT+CWLAP, after listing we get ‘OK’ as response. After listing, Connect to AP with the command AT+CWJAP=ssid,pwd. And thus Commands ESP8266 to connect a SSID with supplied password. Get ‘OK’ as response as shown below. Configure one of the ESP 8266 module as server and other as client. Client section is explained below. Now start a connection as client. (Single connection mode) with AT+CIPSTART=type,addr,port as shown below ,(First three sections of IP address will be same last section only will have some change where 192.168.1.17 is the IP of the router). And then go for sending and receiving data as shown below. Configure one of the ESP 8266 module as server and other as client. Server section is explained below. To communicate with a webpage, we need to start a server with ESP module. You need to set multiple connections using command AT+CIPMUX=1. This initiates the server for a Webserver. To get the STATION IP address, send AT+CIFSR, the module returns the Station IP address, 192.168.1.2 . If the CWMODE is set to 3, you’ll get 2 IP address, one for AP & another for Station mode. We need the station IP address for Client mode operation. Now type the address 192.168.1.2. The browser sends a HTTP GET request which is displayed on the terminal window where ESP module is connected. You will get ‘OK’ as response. 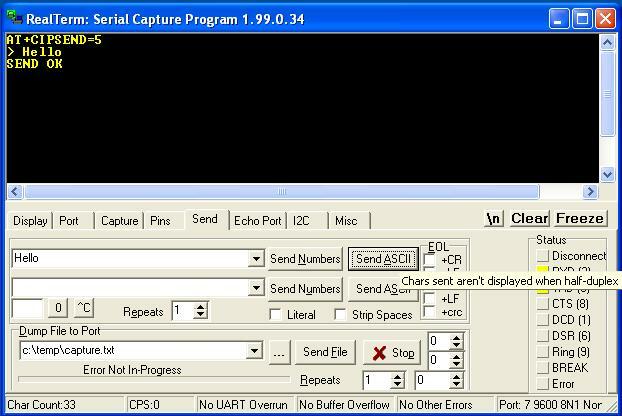 From within ESP window type AT+CIPSEND=0,5. ESP will wait till you type 5 characters. On terminal window the characters are received. You get these inside ESP window +IPD,0,5:HELLO. 0 is the channel of communication & 5 is the number of characters received. Use the channel number which is displayed as CONNECT while a request is received from the browser. After getting > Response send message. Now the characters are sent to the Web browser. But the browser is still waiting for the channel to be closed. To view output the channel should be closed. 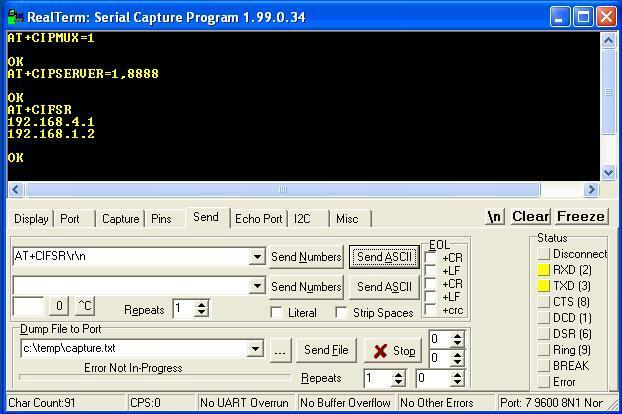 AT+CIPCLOSE=0 command is used to close the channel. Here 0 is the channel ID. Now, you can communicate from your web browser, your phone, laptop, or other Internet capable device to control your projects. But all connections should be from the same network (ie, from same router). So how can you access your WiFi from outside world, from other network. In order to do so we should forward our ESP port to the internet which is completely a routers task. 29 Responses to "Server-Client Communication using ESP8266 Serial WiFi Module (ESP-01)"
Thank you for your valuable feedback! More of these are available here. Think I should buy one. After Interfacing Arduino UNO with ESP8266, i am able to send the characters from ESP8266 module to webpage by using AT commnads i.e AT+CIPSEND=(channel number),(number of characters). Now i want to turn ON/OFF an LED from webpage . 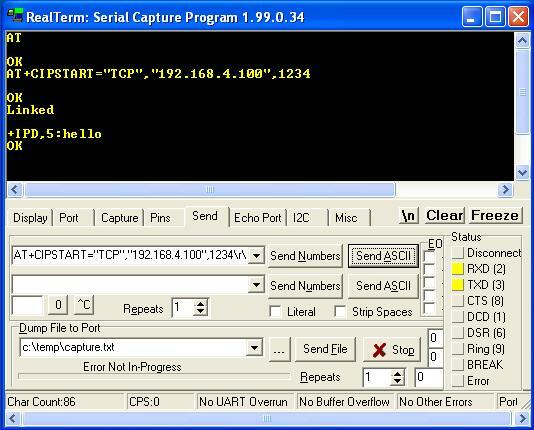 I heard we need to connect to server, So i installed WAMP server software in my windows operating system and tried connecting with AT command AT+CIPSTART=”TCP”,”my local sytem IP”,80,but it is not connecting. Can you suggest me the correct procedure. 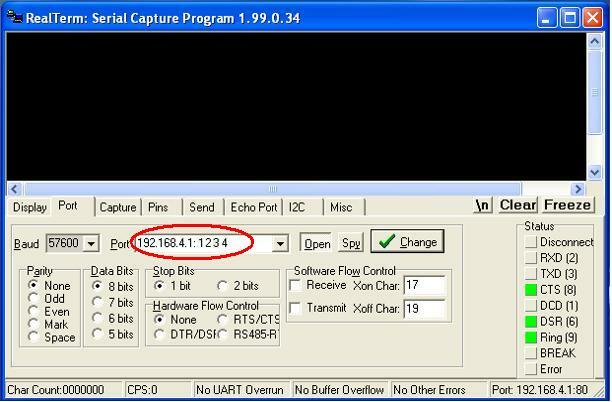 For ESP8266 it has a fixed IP which is 192.168.4.1, so for sending there must be already establish a link. Kindly refer the following AT command. 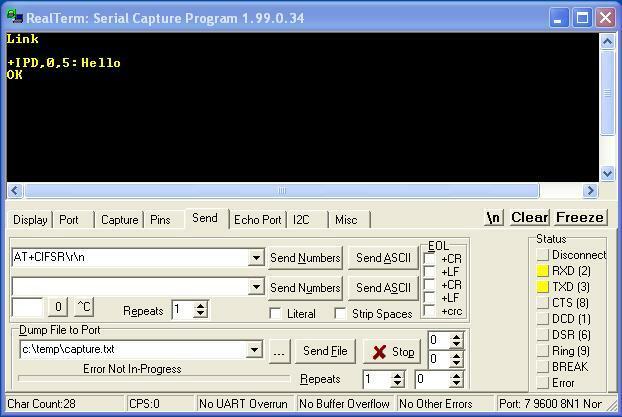 This command is used to get the IP of stations that are connected to ESP8266 softAP. Notes : This command can not get static IP，it is only available if DHCP is enabled. How to connect multiple module..?. I am developing a new IOT Project. I need to connect bluetooth or WI-FI Modules 5 or more than that. Regarding the maximum number of clients, as per the documents available it is 5 . But while we check the wifi by connecting mobile phones as client and esp8266 as server,We can connect only three mobiles more than that is not connecting. Is it possible to connect the ESP8266 to the RJ45? 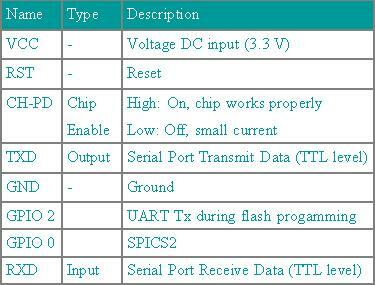 To connect the ESP8266 to RJ45, either by using the RJ45 to TTL converter or design the ESP8266 board which is suitable for RJ45. I just need to know…i’ve connected two esp8266-01. And I am using two Atmega32. Question is 1st mega controller send some data esp received it and transmit it to another esp but does 2nd mega controller receives what esp receive or not ? Basically I want to transmit 1st microcontroller data to another and I’m using esp as a medium for wireless transmission is it possible ? through USB-TTL adopter. All my connection are form. I am not getting OK result at any baud rate . If you receive the acknowledgement (OK) , means the module is working fine. Need more explanation about the query. How to use UDP protocol to comunicate betwen esp2866 as client and esp8266 as server? Can we use this device as stand alone..? That means without connecting to microcontroller. Can two esp devices used for transmission at one end and reception at another end? Yes, you can use esp8266 as a stand alone device. You can connect esp8266 with PC using a level converter and configure it through a terminal software. You can set the esp8266 as a client and server and then communicate through AT command. Hey, I’m working on a project where I want to connect two esp8266 , both in dual mode ie, each esp is a server as well as Client. I have been trying to communicate data between the two devices but still couldn’t make it. Can you help me with the basics please? I have a question about the ESP01, is it possible to send the sensor data (Ultrasonic and IR sensor data) to the PHP localhost server? Yes,You can connect the esp to the local TCP server and send data.